It seems that every time I have a friend visiting me here in New York City, they tell me they can't wait to see the Empire State Building and Times Square. And I promptly groan in dismay. As a native New Yorker, I know there are so many less-visited sights that are ripe with cultural delights. Yet, these rarely seem to make it on many tourists' lists, especially if they only intend to visit the city for less than a week. Nonetheless, I recently guest blogged for GotSaga on the sights I would recommend to my friends visit when they're in town. Here are several additional ones that didn't make it on the list and briefly what I love about each. Not all of these are in Manhattan and not all are good for year-round trips. But they've all got unexpected treasures. * Take a specialized walking tour with Context Travel. Unlike with many walking tour operators, these treks are very small and they are always accompanied by a guide who has a degree or an education in the subject, whether it's architecture, art or cuisine. I took a tour through Little Italy and Chinatown -- where I nibbled on everything from pork buns, five kinds of jerky and Italian cheeses -- and was surprised to visit shops I never knew existed. * Who doesn't know Central Park? But even some New Yorkers have never visited the gated garden within Central Park known as the Conservatory Garden. Stroll here in the early in the morning during the week and you'll have the landscaped expanse with bronzes and blooming flowers pretty much to yourself. * I always come away with a wealth of ideas when I visit the Cooper-Hewitt National Design Museum. But if you think this museum simply exhibits oh, so cool objects that benefit the elite, guess again. An exhibition that will soon end in early January, "Why Design Now," displays everything from a solar water purifier for those living in areas with contaminated water to low-cost eye glasses that allow the underserved people of the world to fill their own prescriptions without the need for an eye doctor. * It sits not even a mile off Manhattan's southern tip but Governor's Island isn't a well-known destination for tourists. It's only open to the public from June to October but I try to get there (by ferry) every chance I can because, after all, how often do you have a car-free island where you can bicycle or walk around the entire circumference that's so close to an urban area? There's something for just about everyone here. History buffs will enjoy strolling around the late 19th century wide-porched houses of Nolan Park and the grander brick buildings along Colonels' Row while art aficionados will want to visit the island when sculptures dot the lawns and paintings hang is some of these houses that once housed officers and their families. I always make sure to buy a double scoop of farm-fresh ice cream from Blue Marble. Then I sit along the shore, enjoy the cool breezes, and gaze at the expansive views of the Statue of Liberty and Lower Manhattan. * Whether you have or haven't heard of Manhattan's Hell's Kitchen neighborhood on the west side, you should sign up for a 3+-hour walking tour with Rum & Blackbird Tasting Tours. Come with an empty stomach because on A Taste of Hell tour you'll eat plenty of homemade treats, including chorizo tocos, milk shakes and empanadas. Even if you're a New Yorker, you'll enjoy this trip, as I did, because you'll find a historic feature, like the little-known 414 Hotel, that you somehow overlooked. * Most New Yorkers and just about everyone else know Staten Island for one thing: the ferry that goes back and forth between Lower Manhattan and the island. I fell into that category as well, I must admit. So you can imagine my surprise when I found out that Staten Island is chock full of pristine green spaces, more than any other borough of NYC. I've blogged about this last year. It is well worth visiting Staten Island and either walking, hiking or bicycling along wooded trails, having brunch along a pristine waterfront, wandering a quiet beach and then enjoying a fresh fish lunch. The Conservatory is among my most favorite spots in Central Park. As a New Yorker, I too tend to avoid the conventional--it's all that tourists gravitate towards. Great post! I would love to go on the food tours! Hi Charu, That's cool that you know about the Conservatory Garden. Every time I mention it to a New Yorker I get blank stares. Hi nopotcooking, I adore food tours, too. Yummie. Well, now I am indebted to you. I didn't know about these Taste of Hell tours. That is the one touristy thing I might allow myself to do in NYC. Well, that and I did once post for a pix with the Naked Cowboy. Couldn't help myself. Hi debbie, That's cool that you got to play tennis on Roosevelt Island. I'm hoping to sign up for lessons in 2011. Hi alisab, I really think you'll enjoy the Taste of Hell tours. You get to sample a wide array of food and it's a neighborhood that a lot of people don't get to poke around much. I still remember as a teenager going on the Roosevelt tram with my brother who worked in NYC. But, of course, I just rode the tram back and forth. Ditto for the Staten Island ferry. These are great suggestions. Great suggestions! As a native New Yorker, I'm embarrassed to say I have missed most of these attractions. I'll have to remedy that as soon as the weather gets a bit warmer. I especially like the idea of a food tour; that'll really appeal to my DH. Hi Sheryl, Oh, no need to be embarrassed: many of my friends have never visited these sights either. For sure, you'll enjoy the food tours. Hi Kristen, Most people I know only ride the ferry or the tram back and forth to either island. When I recently told a native New Yorker about wilderness hikes in Staten Island, they were shocked. Great list! Let me also get in a plug for a wonderful small museum, the Tenement Museum, on the Lower East Side. Excellent, provocative discussions about the generations of immigrants who lived in this area -- and you can step outside and go to any number of wonderful restaurants. What a great list! 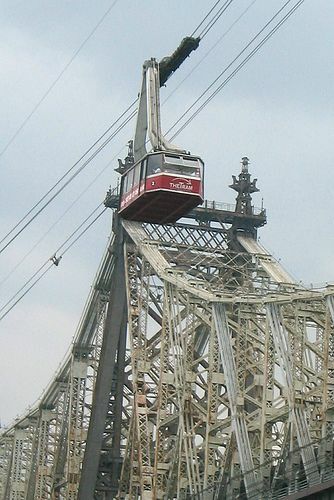 I'm tempted to book a flight to New York just to ride the tram over to Roosevelt Island. Never thought of doing that before. My "undiscovered" spot is the tavern where Washington gave his farewell address to the troops on the southern tip of Manhattan. Love the cobblestone streets--such a contrast to the mental picture of NYC. Hi ruth, Thanks for mentioning the Tenement Museum. Definitely worth visiting and a museum that's often certainly overlooked by tourists and New Yorkers alike. Hi Vera Maria, Glad you enjoyed the list. I also adore the cobblestone streets in Lower Manhattan. I agree that the Fraunces Tavern is a wonderful atmospheric spot. Thanks for the tips! I'm especially intrigued by all the tasting tours. Yum! The Cooper-Hewitt is one of my favorite museums in the city - and I'd like to take one of each item in their gift shop home with me, yes please! What a great list of other sites to visit in NYC. I'd much rather explore the sites you mentioned than see the tried and true NYC travel icons. Hi Susan, I'm very big on food tours, too. And, yum is right! Hi Casey, The gift shop is amazing. But I have to steer clear of it, usually, otherwise I'll walk out with a huge cc bill! Hi Donna, Thanks so much. Really glad you enjoyed my travel tips. Next time you're back in NYC, maybe you'll have a chance to visit one or more of these sights. Great tips! That is the question we've asked the locals we've met in each place we've stayed in over the last 11 months for Grantourismo: where do you take your friends when they're in town? Because often that gets a very different answer to what do you think we should do? The latter will be the usual run-of-the-mill tourist sights, while the former will be more interesting things in their local area or things that locals like to do. We focused on the Lower East Side, esp. Alphabet City area, for our 2 wks in NY for Grantourismo, so did a Tenement Museum tour (brilliant) as well as guided walks with the Lower East Side History Project - highly recommended! Hi lara, That's a great way to focus a trip to NYC. The Lower East Side is often completely overlooked by most tourists. Thanks for mentioning your suggestions. I have an irrational fear of NYC, but I'm determined to get there someday. Some of these sound like they'd be a great way for someone like me to test the waters. Hi kris, If you ever get to NYC, try to call me and maybe we can check out some of these suggestions of mine that sound the most appealing to you. There is so much to see in NYC - when we visit we sometimes do a certain area. You can spend hours walking, eating your way through! Hi mjr, Walking and eating your way through NYC is definitely the way to do it! Great tips, which I'll bookmark for my next trip to NYC, it's been far too long. And for the record, I could so relate to your opening paragraph. I feel the same way when visitors to the Bay Area want to go to Fisherman's Wharf. Hi sarah, Great! Glad my tips might give you some new venues to check out on your next trip. And, that's so true about San Francisco where it seems it's always all about Fisherman's Wharf. Very much enjoyed your NYC hidden treasures and the shout-out to New Jersey. I've shared your blog with some family members who I know will also enjoy. Hi Carol, I'm really happy you enjoyed my tips. And thanks for passing along my blog to your family. Wishing you a Happy New Year, too!